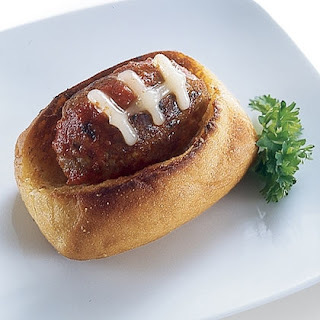 To make a batch, first prepare your favorite meatball recipe, shaping each meatball into a mini football before cooking. Once they're cooked, add the meatballs to a skillet of spaghetti sauce and warm them through. For each sub, cut a V-shaped notch from the top of an individual-size roll, place a meatball in the roll, and top with cheese shred laces. Finally, get the sandwiches in a huddle on a cookie sheet and place them in a warm oven for a few minutes to melt the cheese. 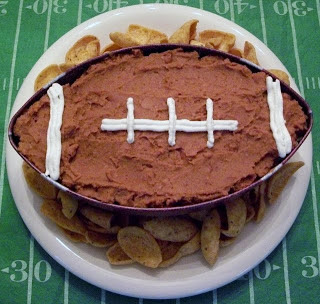 Pipe the sour cream on the top to make the laces.Use a football bowl, or you could just use a round plate and shape a football on that. Just put the shredded lettuce around it and that would look just as good! Preheat the oven to 350 degrees F and lightly grease a baking sheet. Using your hands, combine all ingredients except ketchup and white onion in a large bowl and mix well. 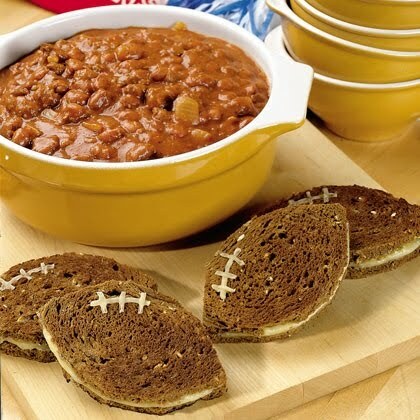 Place the mixture on the baking sheet and mold it into a football shape, making sure to pat down the middle so it’s no thicker than the edges. 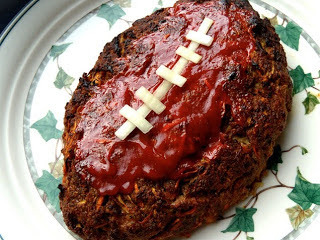 Bake 50 to 60 minutes, until an instant-read thermometer registers 160 degrees F. Remove the meatloaf from the oven and spoon a few tablespoons ketchup in the center to make a base for the football’s “laces.” Slice a thick ring from the center of the white onion, peel off a strand to form the anchor of the lacing and lay the piece over the ketchup. Then cut shorter pieces of white onion to make the lacing’s crosshatches. Serve warm or at room temperature. Warm a lightly greased griddle over medium heat. Sandwich slices of your favorite cheese between pumpernickel or wheat bread. Then use a cookie cutter or butter knife to cut the sandwiches into football shapes. Grill the sandwiches on one side until browned. Then flip and continue to grill until the other side browns and the cheese begins to melt. Garnish with cheese or mustard "laces" and serve while warm. 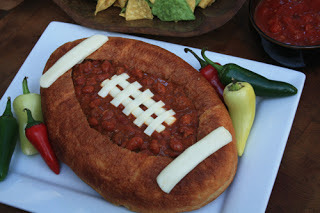 To make arrange pepperoni slices in football shape on top of pizza. Bake pizza as directed on package. 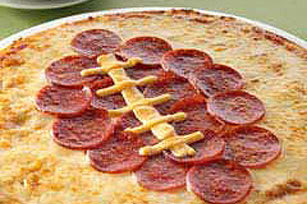 Arrange singles strips on center of pepperoni for the football lacings. Brown 2 lbs of Chili Grind drain off grease add 1 can beef broth, ½ can chicken broth, and add 1 ½ cans of tomato sauce. Bring up to a boil and then reduce heat to a slow simmer for 40 min. Add 1st Dump and simmer for 40 min. then add 2nd Dump cook on low heat for 25 min. Taste you may have to add salt and if it’s too hot, add 1/8 tsp brown sugar if needed. 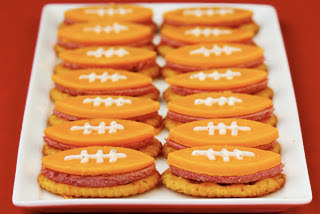 On a sturdy cutting board, use the aluminum can (or cookie cutter) to shape the cheddar and summer sausage pieces into individual “football” shapes. (See photo above.) 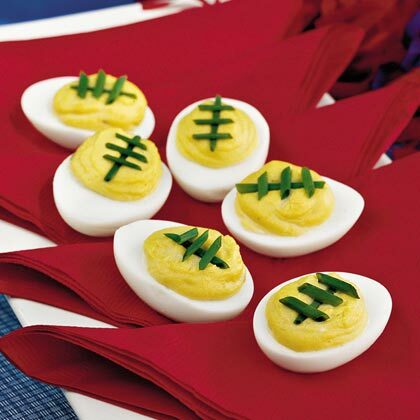 Then assemble the football “bites”, by layering cheddar and summer sausage atop the crackers.Finally, pour some ranch dressing into a Ziplock bag, and then use scissors to snip a very small triangle from one of the bottom corners. Pipe the dressing onto the cheddar to complete the football bites.